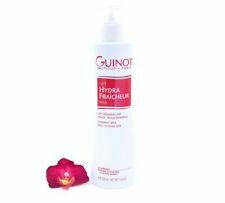 Guinot Hydra FRAICHEUR Refreshing Toning Lotion 200ml - All Skin Types. Rose Extracts tone and soften. 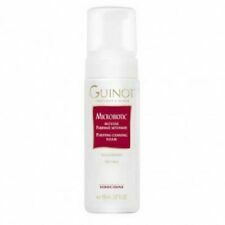 Give your skin deep purifying cleanse with Guinot Microbiotic Mousse Purifying Cleansing Foam. This anti bacterial deep cleansing foam will purify and rebalance your oily skin. It has a foam formulation that cleanses deep into your pores to remove and prevent bacteria, which causes spots. Lait Hydra Fraîcheur. 500ml Salon size. Cleansing Milk. Refreshing cleansing milk suitable for all skin types. Gently emulsifies to remove make-up and impurities. Guinot Lotion Hydra Beaute Beaute Comforting Toning Lotion is an effective toning lotion that tightens and soothes skin while completing makeup removal. The gentle formula adds a layer of comfort to dry skin by restoring hydration. Guinot Lotion Hydra Beaute Confort / Comforting Toning Lotion is an effective toning lotion that tightens and soothes skin while completing makeup removal. The gentle formula adds a layer of comfort to dry skin by restoring hydration. Lait Hydra Fraicheur. Refreshing Cleansing Milk. Texture: Fluid Milk. Original, genuine, 100% authentic, new and fresh skincare products only. Active component. The Microbiotic foam cleanses oily skin deep down, purifying the microbial flora. Its acid pH curbs secretions and provides a shine-free complexion. Use daily morning and nightly. We are very serious against false claims. Guinot Demaquillant Hydra Sensitive Delicate Cleansing Milk 200ml. Products stated as "For parts or not working " are sold "as is " without any warranty. Doing that is against U.S. and international laws. Skin Ceuticals. Perfect for all skin types. Leaves skin soft & comfortable. Jean Paul Gaultier. - Over 15,000 authentic products. Estee Lauder. Elizabeth Arden. Skincare by Guinot. Skincare by Guinot. Skin Ceuticals. Leaves skin calm & supple & comfortable. (如果是寄送到中国的订单，请提供您的中文名称和地址，以及您的电话号码。). - Over 15,000 authentic products. Elizabeth Arden. Containing cornflower extracts to soothe tightness & dryness. Size : ( 6.7oz, 200ml ) X 2. Guinot Comforting Toning Lotion (For Dry Skin) has the following feature ( 6.7oz, 200ml ) X 2. A gentle and alcohol free formula enriched with active ingredients, specifically suited for dry skin. When your skin is thoroughly cleansed, pore size will appear reduced and skin feels perfectly polished. Lotion Hydra Fraicher not only makes sure your open-pore woes are a thing of the past; it also soothes breakouts and irritation with extracts of rose. Guinot Lait Hydra Fraicheur contains rose water, with a delicate rose scent, to gently refresh your skin. Guinot 200ml Lait Hydra Fraicheur Refreshing Cleansing Milk All Skin Types (Aloe Vera Extract). Manufacturer: Guinot. When your skin is thoroughly cleansed, pore size will appear reduced and skin feels perfectly polished. Lotion Hydra Fraicher not only makes sure your open-pore woes are a thing of the past; it also soothes breakouts and irritation with extracts of rose. Manufacturer: Guinot. Size: 200ml. When your skin is thoroughly cleansed, pore size will appear reduced and skin feels perfectly polished. Lotion Hydra Fraicher not only makes sure your open-pore woes are a thing of the past; it also soothes breakouts and irritation with extracts of rose. 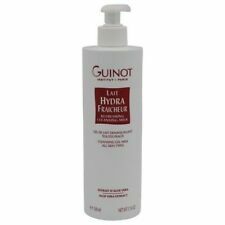 Guinot 200 ml Lotion Hydra Confort Comforting Toning Lotion (Lotus Extract) Dry Skin alcohol-free toner is the ideal product for your dry, tight skin. The toner will complete the removal of make-up that may be left after washing your face. Guinot Comforting Toning Lotion (For Dry Skin) has the following feature Size : 6.7oz, 200ml. 6.7oz, 200ml. Lotus Extract softens, protects dry skin and provides an anti-free radical effect. A gentle and alcohol free formula enriched with active ingredients, specifically suited for dry skin.